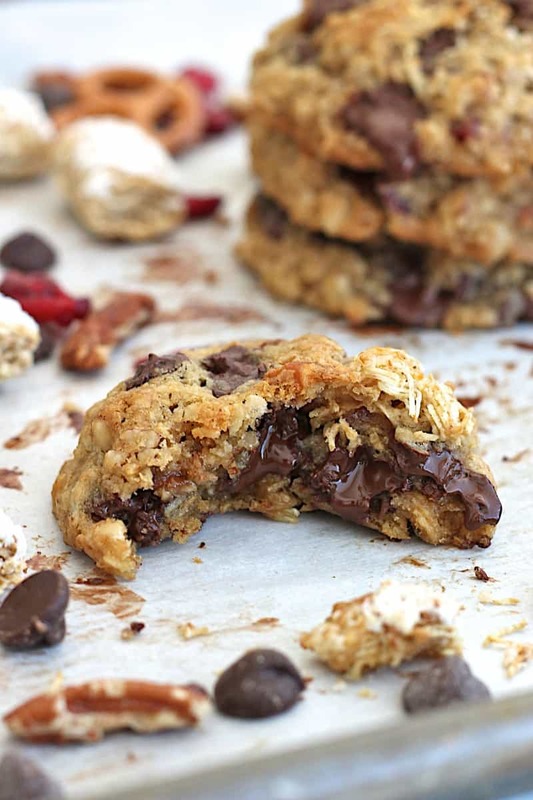 All your cupboard favorites baked into a crazy good cookie. 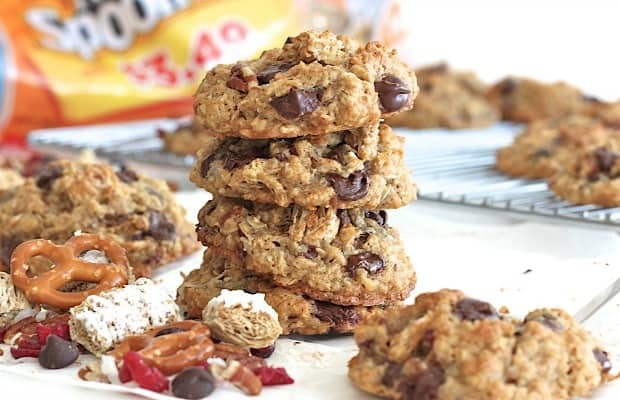 Frosted Mini Spooners, pretzels, oats, coconut, pecans, dried cranberries and chocolate chips come together in these chewy-crunchy-sweet-salty delicious cookies! 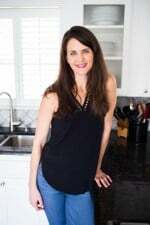 Let’s open our cupboards and bake some cookies! You have to look beyond the baking shelf for these cookies though. 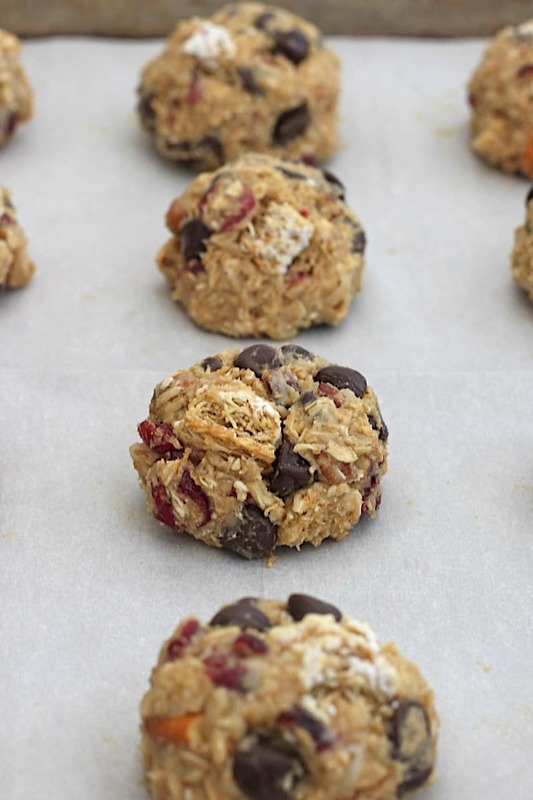 They’re packed with cupboard staples like pretzels, pecans, dried cranberries, coconut, oatmeal, chocolate chips and cereal. Yes, I said cereal! Not just any cereal though. It has to be Malt-O-Meal® Frosted Mini Spooners! You know, the bite-sized wheat cereal with a layer of frosted sugar on top?! 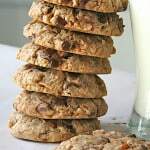 Yeah, well those irresistible layers of wheat and frosty sweetness crushed throughout these cookies gives them the most incredible texture and taste. I was so excited when Malt-O-Meal announced their spotlighted cereal for the month of May would be Frosted Mini Spooners! This cereal is a cupboard staple in our house for sure. Love love love those crunchy layers of wheat with frosted sugar on top. I could snack on this cereal all day. 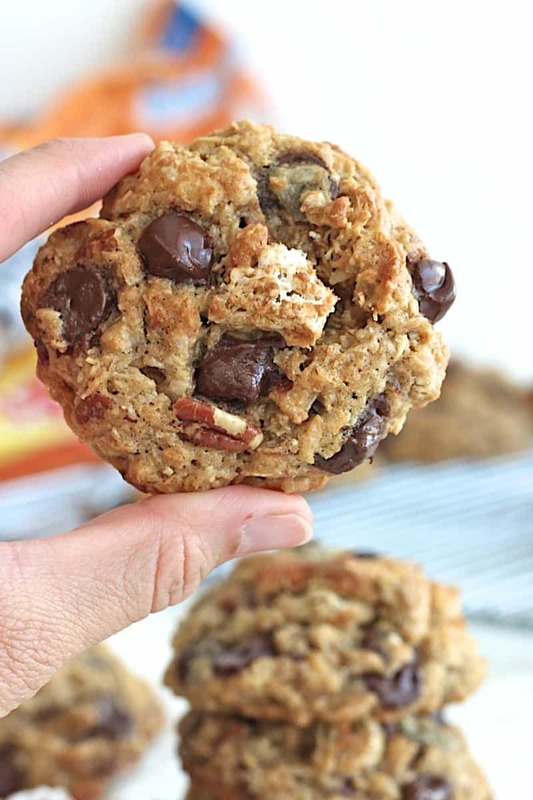 I’ll grab a handful here and there to curb my cravings, but I also love crushing it over yogurt for a parfait, served in a bowl with a little warm milk poured over it and now baked into cookies!! Mmmm…mmmm! 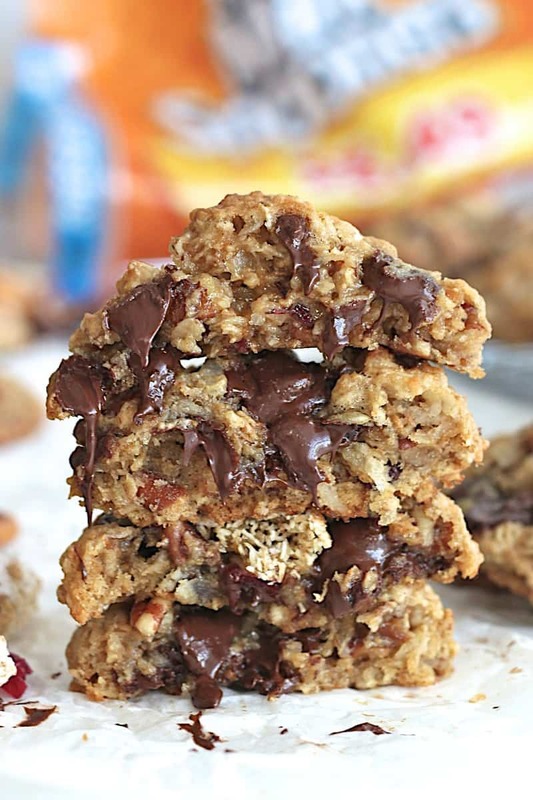 Why oh why had I never thought to bake this cereal into cookies before?! 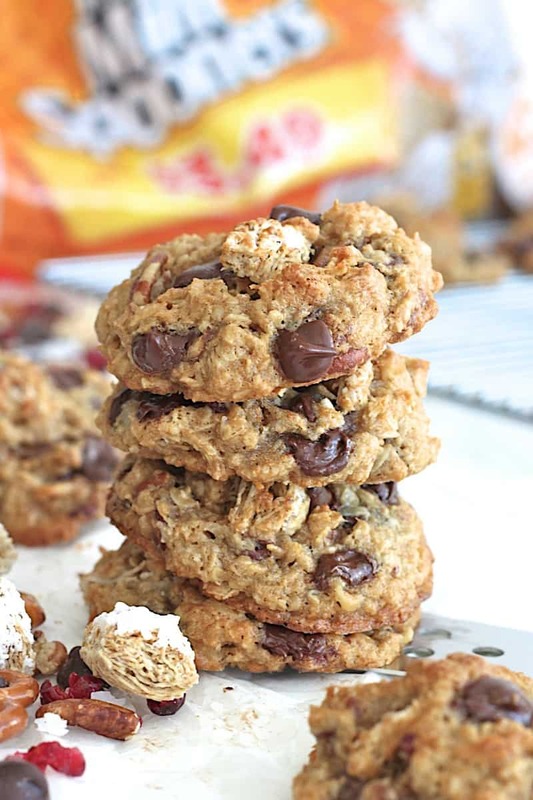 The Frosted Mini Spooners are definitely a must in these cookies, but when combined with all of the other cupboard staples, these cookies become so crazy delicious you’ll want to clear the cupboards and bake them all the time! They’re chewy, crunchy, sweet and salty. 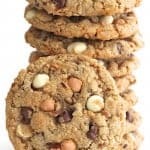 They’ll satisfy any cookie craving you could ever have. 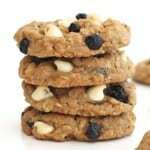 In fact, they’ll become you’re most craved cookie yet! 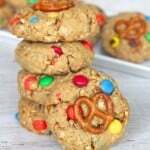 So go raid your cupboard and bake these cookies! They’re crazy good! 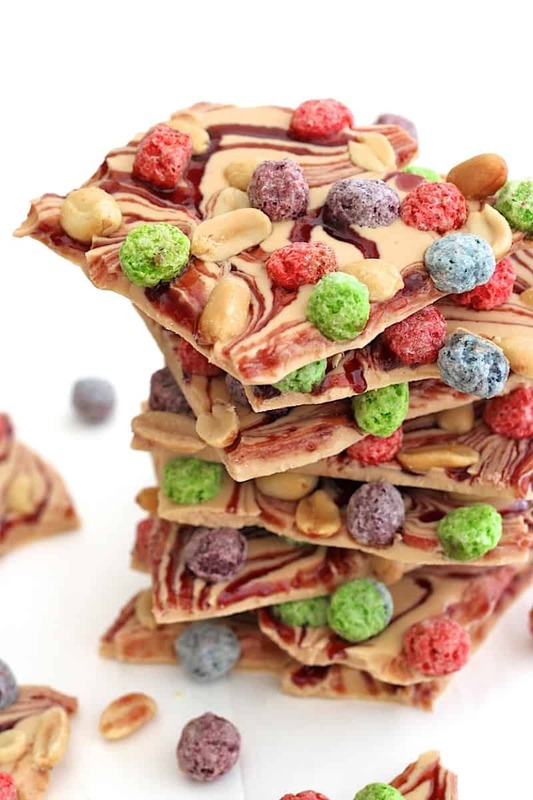 This recipe was created as part of my partnership with Malt-O-Meal® brand cereals however thoughts and opinions are certainly my own! In the bowl of an electric mixer fitted with the paddle attachment, beat the butter and sugars until smooth. Add the eggs and vanilla and beat until well combined. Add the flour and baking soda and mix until just combined. 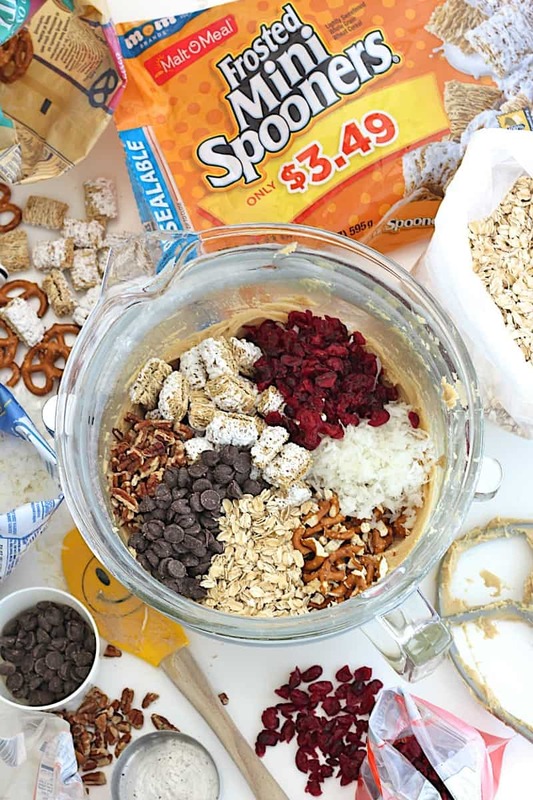 Add the Frosted Mini Spooners, oatmeal, pretzels, pecans, coconut, dried cranberries and chocolate chips and mix on low speed until well incorporated. 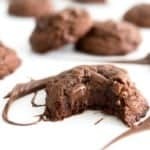 Using a medium cookie scoop, drop 1.5 tablespoon-sized portions of dough a few inches apart onto lightly greased or parchment-lined baking sheets. Slightly flatten the top of each scoop of dough with the palm of your hand. Bake cookies for 12-14 minutes or until golden brown, rotating baking sheets halfway through baking time. Let cookies cool for 5 minutes on baking sheets before transferring to a wire rack to cool completely. 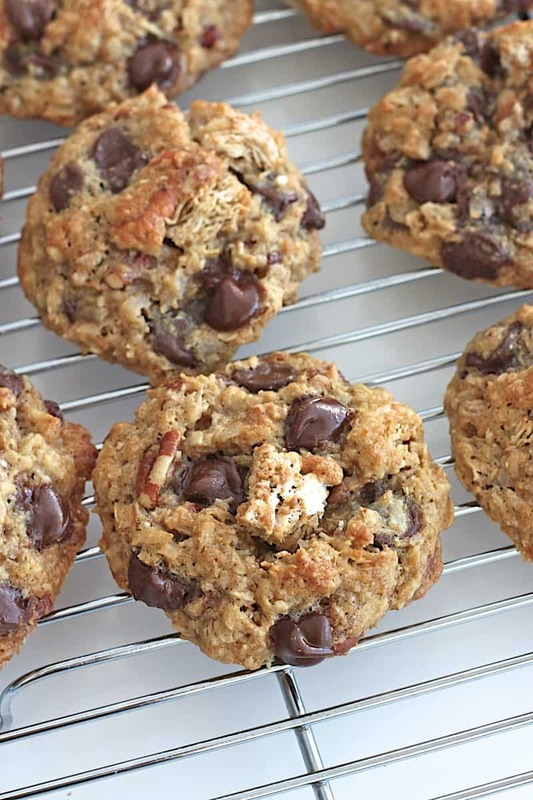 I would have never thought to throw cereal into my cookies! Now I can eat them for breakfast right? !